A child who has hearing loss will have difficulty detecting sounds which are made in the normal speech range. This condition may be present from birth, or it may appear as the child develops. When babies are born with birth defects, they have an increased risk losing their hearing. While the majority of deaf children are born to parents with normal hearing, this condition may be inherited. 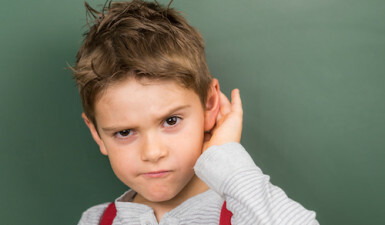 Conductive hearing problems are the most common in children, and appear when the ear blocks the transmission of sound. This problem may be temporary or permanent, and may be present in one ear or both. In some cases conductive hearing loss may be a result of defects that the child is born with, but it may also appear as the child grows as a result of ear infections. Other factors that can lead to conductive hearing problems include a buildup of earwax, a perforated eardrum or objects within the ear. Sensorineural hearing problems involve issues with sound processing by the hair cells (cilia) which are deep inside the ear, and which are responsible for transferring sound to the brain. Hearing loss that results from this condition is permanent, and will affect both of the child’s ears. Like other hearing problems, it may be present from birth or may develop later on. Some factors which can lead to sensorineural hearing loss include infection, head injury, extreme noises and toxic medications. Additionally, the condition may be inherited. It is critical for parents and doctors to identify infant and child hearing loss as soon as possible. Ideally, this should be before the child reaches 6 months. Too often, hearing problems aren’t discovered in children until they are being evaluated for performance problems in school, and even a minimal loss of hearing in a single ear can dramatically impact a child’s ability to develop language skills. Dr. Samadi will review the medical history of the child and will also perform physical examinations of the ear. This will help us to determine the cause of the hearing problems and develop an accurate diagnosis.